High-Intensity, Battery Powered LED Stroboscopes. The DT-365 and DT-365E High-Intensity, Battery Powered LED Stroboscopes are velocity analyzing and measuring devices that are ideal for machinery process inspection. 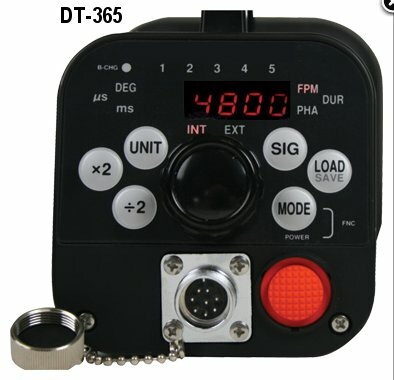 The DT-365 and DT-365E Stroboscopes are capable of flashing their LED lights in a synchronous frequency to the operating machinery, creating the illusion of viewing slowed or frozen images. Utilizing this phenomenon of slowing or stopping the motion with the adjusted flash rate of its LED lights, machine parts and processes may be inspected for defects, aiding in preventative maintenance programs. This LED technology extends operation due to the low energy requirement of the light diodes compared with xenon lit stroboscopes. Proper operation is assured as concern of light failure during usage, common with xenon bulbs, is eliminated. 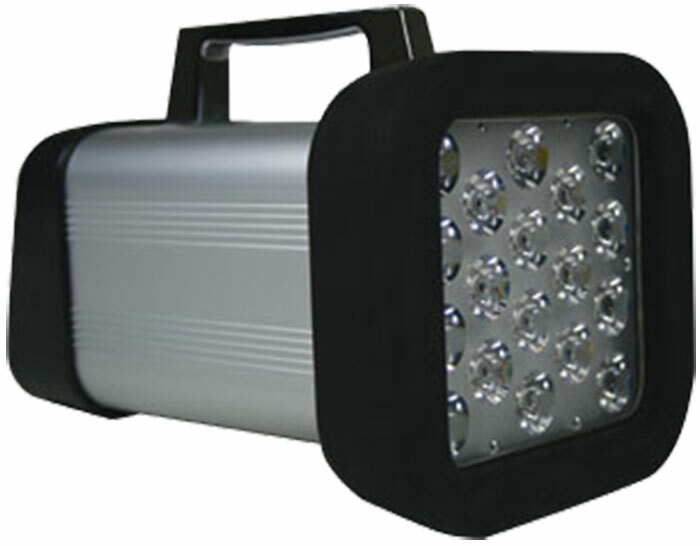 The light output (Lux) of the LED’s is far brighter than xenon powered stroboscopes with the DT-365 outshining all comparable stroboscopes on the market from its array of 18 LED’s and 6 LED’s for the DT-365E. The operation panel is a vibrant red LED display that is ideal for viewing in dark locations. 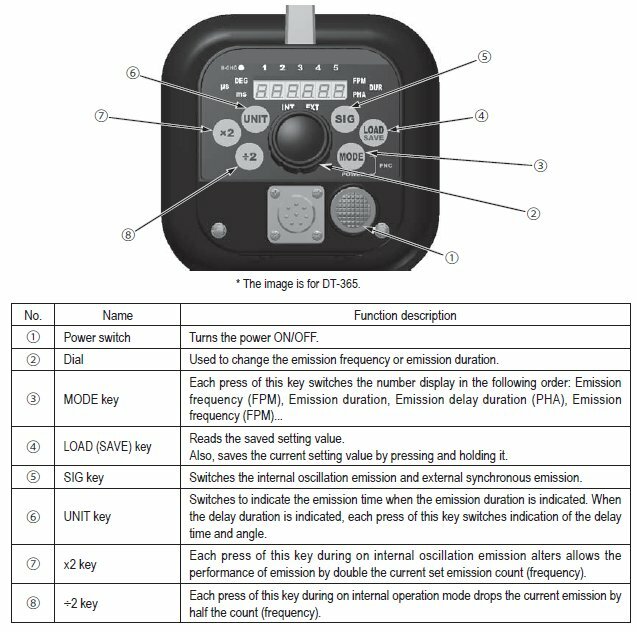 The simple to use keypad plus rate adjustment dial aids in making quick changes of the flash rate to coincide with changes in the speed of your process. 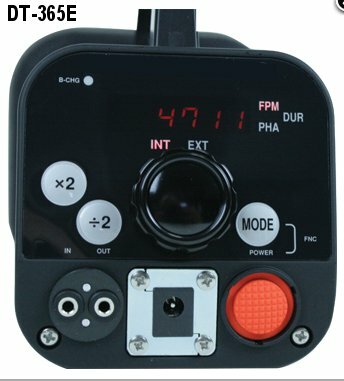 The dial allows fine-tune altering of the flash rate while the x2/÷2 keys enable large spanning over the entire flash range. The DT-365 & DT-365E have the added feature of modifying the flash duration or on time which aids in picture clarity often necessary in printing processes. The phase shift function is ideal for rotating equipment where the user needs to change the focus on different blades, gears, or section of the machinery. These stroboscopes are also capable of being synchronized with an input signal. 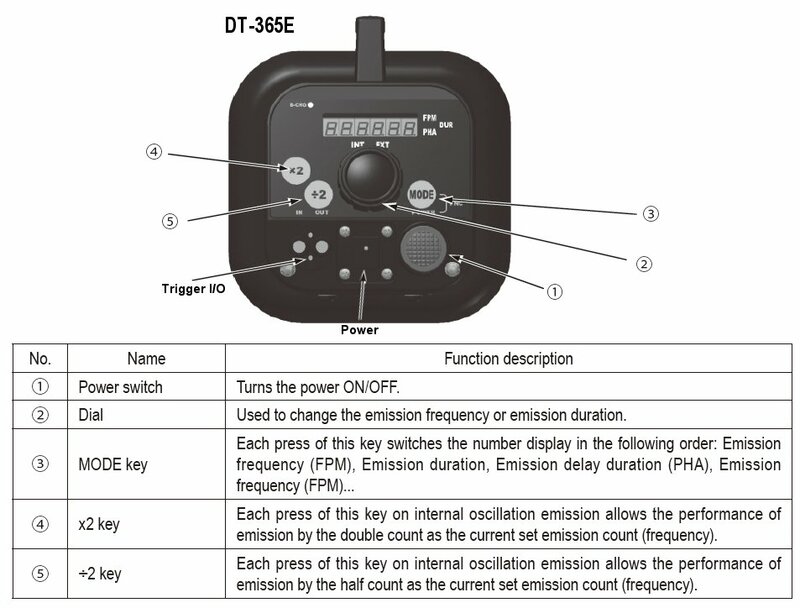 To complete the system, the DT-365 has a power output to supply an input sensor if desired. The robust aluminum housing is NEMA-4X (IP65) protected allowing usage in harsh plant environments. The DT-365’s array of 18 LED’s allows continuous operation from 2 to 5 hours while the DT-365E’s array of 6 LED’s allows 3 to 8 hours depending on user settings. Typical applications for the DT-365 and DT-365E are to determine speeds, inspect rotors, meshing gears, motors, textile equipment, printing production lines, conveyors, industrial fans, pump operation, vibration equipment diagnostics and many more. Lux Rating (Approx.) 6000 FPM & 3.6° (100 µs): Distance 8" (20 cm) 18,400 lx with 10" (250 mm) irradiation dia., Distance 20" (50 cm) 6200 lx with 13.5" (350 mm) irradiation dia. Lamp Lifetime Typ. 50,000 hours. Varies depending on usage.